How to Fix Home Water Damage? Water Can Seep into Your Home And Cause Harm To You And Your Property. Find The Source: Identifying where the water is coming in can help you point your contractor in the direction of what needs repair! If you cannot, water leak detection can ensure that leaks affecting your home can be identified and repaired, no matter the source. If Possible Impede its Growth: Depending on where it is located, you may be able to use a temporary patch kit to prevent more water from coming in and causing more home water damage. Save Your Property: Be sure to safeguard your furniture and property to prevent the water from wearing them down. Use tarps and move them away from the source of water. Contact For Repairs: Reach out to a contractor for repairs and restoration of your property. They can get your plumbing, roofing, and home structure back to its best before you know it! How Can I Protect My House From Water Damage? 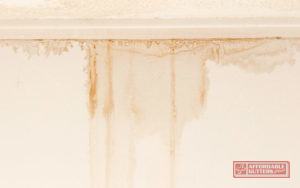 Preventing home water damage is a simple matter of keeping your home defenses at their best. Always take the time to look at your roofing and plumbing systems and have regular maintenance to stop the home water damage before it starts. During this time, also check out your gutters as they carry water away from your home. Wear on your gutters can prevent this, allowing water to back up and damage your property. If your gutters need repair or you need a whole new installation, Affordable Gutters Plus LLC is here to help you! We provide your home with Canton and Roswell, GA gutter installation. Give us a call today at 770-735-4433. Posted in Uncategorized on September 10, 2018 at 4:30 pm by Affordable Gutters Plus LLC.